Hewlett Packard - and the end of printed paper books? Book Liberation - peripatetic books? The death has occurred in France on 20 July 2003 of Nicolas Freeling, a novelist best known for his Van der Valk and Castang crime stories. Born in London in 1927 he spent his childhood in England, Ireland and France. As a young man yearning to write he travelled in Europe and, while working as a chef in Amsterdam, was arrested and interviewed by the Dutch police. This experience gave him the basis for the creation of Inspector Van der Valk in his first novel 'Love in Amsterdam' published in London in 1962. He returned to live in Amsterdam and further novels followed but he upset his readership when, having moved to France and lost touch with the current idiom of Holland he killed off Van der Valk. He then concentrated on a new hero, the French detective, Henry Castang, who first appeared in 'A Dressing of Diamond' in 1974, and his Castang novels were eventually regarded by many as the superior of the two. There have been thirteen Van der Valk and sixteen Castang titles as well as seven other books. A winner of the Crime Writers' Gold Dagger (1964) and the Edgar Allan Poe (1966), his work has been critically acclaimed as being that of a literary novelist who used crime as a background rather than as a straight crime writer. Stephen Foster reports: It is with sadness that we record the death on 13th August of a well-known bookselling colleague Peter Harrington, founder and co-owner of Peter Harrington Antiquarian Books, The Old Church Galleries and The Chelsea Bindery. Peter started selling books in the late 1960's, and his brother Adrian joined him in the business in the early 1970's. Harrington Brothers were a major presence in the Kings Road Chelsea for over 25 years, selling fine bindings, travel and literature. In the late 1990's the brothers sold the premises and there was a mutual split of the business, Adrian moving to 64a Kensington Church Street and Peter to 100 Fulham Road, where he was joined by his son Pom in their splendidly fitted shop. Despite his illness, Peter's death came as a real shock. Being my bookselling father's oldest customer, I remember him being an active part of my formative years in the book trade - always a keen and astute buyer. He was always so full of a love of life and had a tremendous generosity and energy, as well as a good tale and a ready laugh. He will be greatly missed. The bookshop, gallery and bindery will continue to be run by the family and their capable staff. There will be a memorial service at 11am on September 4 at the Brompton Oratory, Brompton Road, London SW7, and rather than flowers Peter had asked for donations to be made to The Royal Marsden Hospital, to help support those that provided expertise and kindness during his illness. The long-list of chosen from 117 nominations for The Booker Prize 2003 is set out below. The short list of these will be announced in mid September and the winner will be announced in October. There is now so much hype about the value of rare books that book collecting has once again made it as a recommended alternative investment in the Financial Times. This has been boosted by publicity about the record prices paid for Harry Potter first editions. When this happens, as it does every so often, it is good to remember that books are for reading as well as buying, selling or hoarding. I have a personal list of authors who I can read at any time for sheer enjoyment. Some of the authors on my list are both well known and highly regarded by the literati. George Orwell is my favourite in this group. He wrote some of the finest prose of all 20th century authors. A superb example is the essay ‘Shooting An Elephant’ which exemplifies the clarity and simplicity of his style. If I had to nominate the best essay ever written I would choose ‘Shooting an Elephant‘ - a choice which Charles Lamb’s aficionados will probably dispute. However read it and compare with one of Lamb’s celebrated essays like ‘The South Sea House’ or ‘A Dissertation on Roast Pig’; for me Orwell wins hands down. Another favourite of mine is J.B Priestley. I do not remember reading any of Priestley’s many novels and essays without being delighted by the ease of his prose. For satire that still hits the spot with unerring accuracy he cannot be beaten. Try ‘The Image Men’ (published in two volumes : ‘Out of Town’ and ‘London End’). This is a tale of two Academic chancers who, with immense style, invent and corner the market in image creation and manipulation. I wonder if some of their recent disciples are Mr. Campbell and his fellow spin doctors - if so the style went missing. J.B. Priestley seems to be unfashionable these days and is little read apart from The Good Companions and possibly Angel Pavement. For the collector this is a real bonus as prices are moderate and the supply plentiful. Two other authors on my list who are also unfashionable are Galsworthy and Kipling. Galsworthy may have been serialised on TV but I wonder how many people have actually read ‘The Forsyte Saga’ and the ensuing novels and interludes. I am sure the way Soames Forsyte is depicted would be a surprise to many people who have seen the TV series. The simplistic, politically correct portrayal of Soames on TV is a travesty of Galsworthy’s much more complex character. Political correctness brings me inevitably to Kipling. Rudyard Kipling is one of the giants of 20th century literature but for many years was shunned because of his alleged imperialism. I cannot believe many of his critics had actually read his books - unless of course they were authors jealous of his prolific talent. Kipling is a joy to read, although some of his most famous works are not his best. For instance I far prefer his ironic look at our attitude to soldiers in ‘Tommy’ to the ultra-famous ‘If’. The book collector as always benefits from the vagaries of fashion and can acquire nice first editions of Galsworthy and Kipling at relatively modest prices (excluding The Jungle Books and Just-So Stories) and in Kipling’s case there are a very large number of books to collect. Small volumes of essays are a particular pleasure of mine and the 1920’s to 1930’s was the golden age of light essay writing. There is a wealth of material here for the reader and collector. I have two favourites - Robert Lynd [1879-1948] and E.V. Lucas [1868-1938]. Robert Lynd wrote on many subjects but is best remembered for his many volumes of essays on all subjects under the sun. You may not share my enthusiasm for these writers but there will be authors who appeal to you as much as these do to me. They may not be fashionable or particularly intellectual but you can return to them again and again. For the reader and collector there is no greater pleasure than finding the authors you enjoy and collecting their books - and if they are unregarded or unfashionable you will be able to assemble your library at a very modest cost. Hewlett Packard - and the end of books? An electronic book is in development by the computer giant Hewlett Packard which has drawn the suggestion that if it can be perfected, it will spell the end of books as we know them. Designed to help promote the market for the e-book, the device is hand held with a high resolution 100 dpi screen and displays the double-page spread of an open book. 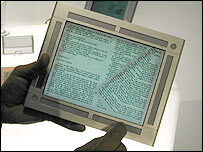 Touch sensitive strips at the sides and upper and lower edges allow the user to navigate through the book and the appearance on the screen as they do so is that of a turning page. To give a daylight-like appearance to the backlit screen there are power consumption problems which have still to be overcome and resolution may need to wait for new technology. Bi-stable displays which retain their state even when power is removed would be an answer but that technology is not yet ready for use. 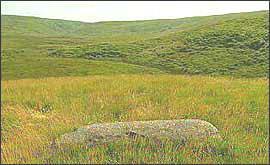 The location on Dartmoor of the memorial stone of the late Poet Laureate Ted Hughes has been established and a guide to finding it has been published by John Bainbridge of the Dartmoor Preservation Association on WWW. Ted Hughes requested in his will that his memorial should be that his name be carved on a long slab of granite which should be placed between the sources of the Teign, Dart, Taw and East Okement, one of the most remote parts of his beloved Dartmoor. His wishes, by special permission of the Duchy of Cornwall, were carried out but the actual location has remained a mystery for some time. It is unlikely to become over-run with visitors, however, as to visit the memorial involves an eight mile walk over difficult and sometimes dangerous countryside, through part of a miltary firing range and past old disused mines. The advice if undertaking the walk is to wear stout boots, carry waterproofs, a map and compass, to check on the firing times of the military range before setting out and to be aware that a mist can suddenly descend. A weird phenomenon has recently been reported. The brainchild of Ron Hornbaker, his website BookCrossing.com encourages readers of books to register them with the site, label the book with the registration (BCID) number and then release them 'into the wild' for others to read. The place of release can be anywhere of your choosing, from a park bench to a bus. Begun in early 2001 the website now has over half a million books registered in 80 countries, and records over 2000 books in the UK released into the wild the last 30 days and yet to be found. The finder of each book is encouraged to read it, record their comments on the site and leave it in the wild again for someone else. It all sounds harmless fun - and it might explain some odd markings in books that you come across. Let's just hope that Book Liberation does not develop a 'militant tendency' to release books that are currently perfectly happy in captivity!